Yup, more EV stuff today. This car [Cache mirror]is just so impressive that I think it’s definitely worthy. The car is a Birkin S-3 reproduction kit. Instead of the 4 cylinder, he put in a 3 phase 100HP, yes, 100HP electric motor. That’s pretty kickin. The *really* interesting twist is the battery pack. 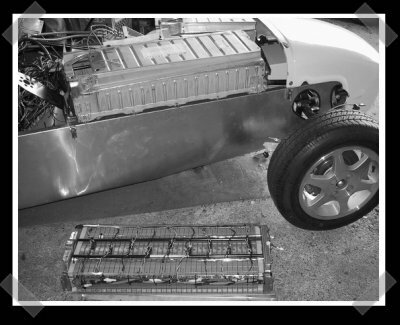 Multiple hybrid car battery cells (think prius NiMH) were salvaged to provide the juice. It runs around on tires designed for the EV1. Is 100hp more than the original lotus 7 engine? At any rate the power:weight ratio must be insane. Not only that, but hes running the motor directly to the wheels, and electric motors have CRAZY torque all through the RPM range. That thing must take off like a bat out of hell. It needs to be green and yellow, with the registration plate “kar 120c”! wow, we alredy blew thier server….. Does anyone here know how to get a hold of some LRR (low rolling resistance) tires? I would like to get some for my turbo-diesel beetle, but I’m not sure if they sell them at regular tire places, or if you have to buy them specially. Check out http://www.tdiclub.com. The forums there will be a better place to ask about those questions. I love my TDI wagon, 52mpg chipped. This is truely amazing… certainly not a job for the home hobbyist, but very, very impressive nevertheless. and I’m with #9- the acceleration must be something to behold. My VW TDI is way cool too. Performance AND economy. I’d be throwing an motor speed controller with an analogue input on the accelerator or a vfd/plc combo to control everything on the car. The original 7 had 49 and 70BHP depending on the model of the original year of production. although most replicas have 150BHP Plus, up to 600BHP from the turbo Hayabusa powered cars! >>>It needs to be green and yellow, with the registration plate “kar 120c”! He stole my idea! After reading the EVUK electric vehicle site I was all set on building an electric Se7en.. after I graduate that is. Still, I don’t think anyone’s built an electric Fisher Fury yet.. now that I want to see. The site still appears unhappy (no images, just the home page HTML) and the coral cache gives error 400s, any other ideas or do we just have to wait for the traffic to die down a little? #14- there are plenty of home hobbyists converting ice cars to electric, if anything this should be easier because you don’t have to work with the car’s old transmission and so on. Google electric car conversion to see just how many people already do it. I’m certainly appreciating all the ev stuff on hackaday- please keep it up, we need to persuade more people that electric cars aren’t hopelessly impractical milk floats any more! He mentions his charger and his source for the batteries (scrappers, even in january 2002) and tires- if anyone can find contact details, I’d love to ask him for some tech specs (the rather wooly “re-engineered to produce four times the original capacity and power” statement could do with elaboration). hate to burst your bubble, but the acceleration would not be as “bat-out0of-hell”-ish as you may think. sure electric motors have crazy torque, but thats only because the power output remains the same. power and torque are related, power=(torque x RPM) /some constant, therefore the torque would be around infinity at zero RPM, but the power is not, and the POWER defines the acceleration. I’m not sure if the horsepower figures listed here are the ICE (internal combustion engine) equivalent, but because electric motors are measured at continuous power and ICE are measured at peak power, you can get a rough conversion buy multiplying the rating on the electric motor by 8 or 10. eg, a 20 HP electric motor is approx equivalent to a 160-200 HP ICE. Hiya, just needed you to know I have added your web blog to my Google bookmarks because of your extraordinary blog layout. But seriously, I do believe your blog post has one of the finest theme I’ve surfed to. It really makes reading your blog much easier.